Saudi air defense forces intercepted 7 ballistic missiles fire by Houthi militia in Yemen targeting Saudi territories said the spokesperson of Coalition air defenses. According to Saudi local news AlArabiya report, Three missiles targeted Riyadh, the Capital city of Saudi Arabia, One towards Jizan, One towards Khamis Musaith and one towards Najran. Missiles were targeted at residential areas. - As per Saudi Press Agency statement, All the 7 ballistic missiles were successfully intercepted and destroyed. However fragments of some of the destroyed missiles landed on residential areas which leads one Egyptian civil worker was killed and 2 were injured said in the news. 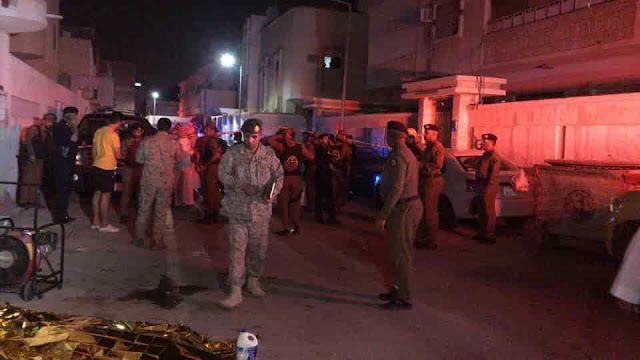 - Social media users witnesses the loud explosions sound and bright flashes late night in the sky of Riyadh, Most of the people posted the recorded videos online. which is because of the missiles shot down, However no causalities have been reported. - Since last year November, Yemen's Iran aligned Houthi militias have fired multiple missiles into Saudi Arabia, All of the missiles Saudi forces intercepted successfully without causing any damages to lives or properties.